The Samoa Independence International 7’s competition is back. This was confirmed by Organizing Committee member, Seumanu Douglas Ngau Chun. Samoa Independence International 7’s was launched back in 2014 and this year will be the 4th year since it was first introduced. The tournament will kick off 1st -2nd of September this year. According to Mr Ngau Chun, this year’s tournament was moved to make way for Samoa’s first Super Rugby game played on island. The SI.I. 7s Organizing Committee rescheduled the tournament for the Teuila Festival, to boost the level of excitement during the Teuila Festival. Mr Ngau Chun also emphasized the aim and objective of this tournament for Samoa. Since the tournament started, few teams from abroad have taken part. Mr Ngau Chun said the only problem the committee encounters is securing sponsors to promote the tournament, so the Organizing Committee is still working hard to get more sponsors to assist them to host the tournament. This year’s tournament is also a joint promotion with the Ministry of Health competition of Healthy 7s, promoting healthy lifestyles within Primary and College levels. Primary Schools and Colleges will take part in this tournament. Twelve local teams have registered and they are ready to take the field for this exciting event. Mr Ngau Chun also said the tournament will help to trial players for our National 7s team. 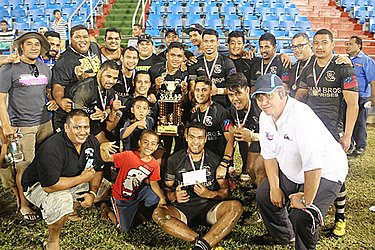 Last year, Ulalei Blackie Vaiala took the Cup, defeating a Fijian team that won the 2015 final of the Samoa Independence International 7s tournament.